Freshly laid turf is often damaged by lawn grubs mostly in wet weather between January & April. The problem is worst in couch lawns especially in areas surrounded by a lot of bushland. The lawn grubs life cycle begins with moths laying eggs on houses (eaves) or trees. If you suspect an infestation leave a wet bag over a section of the lawn overnight and check for grubs in the morning. If the grubs are present you will need to treat with a recognised lawn grub killing chemical, this can be purchased from hardware stores, super markets, nurseries or other outlets. Where turf, particularly Buffalo is laid on poor sandy soil in a hot dry situation dry spots may appear. Spike the affected area with a garden fork. 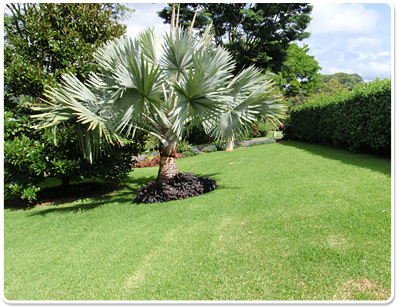 Treat affected area with a soil wetting agent such as 'Wetta Soil'. Keeping grass thick and healthy is the best defence against weeds. NEVER use 'Weed N Feed' on Buffalo lawns. Only use weed sprays specifically for Buffalo. 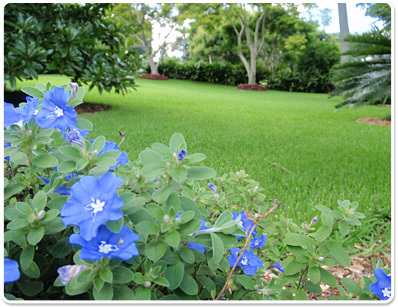 A wide range of weed sprays are available for use on couch grasses because of its widespread use for many years in the sports turf industry.